When we know the grace of God crashing over us in Jesus Christ, we experience a culture shock. The gospel brings us face-to-face with who we really are: sinners who don’t deserve God’s love. Yet at same time we discover that God loved us enough to become human and die for us. All of sudden we find that the world we always knew, our way of life, has been turned upside down by his reality, by God’s call upon our lives. It is this culture shock that Jesus addresses in the Sermon on the Mount. In it he describes this new reality: what it looks like to live right side up in an upside down world. We live in a world that is not what it should be. The crowds that flock to Jesus in Matthew 4 and hear the Sermon on the Mount are described as sick, afflicted with various diseases and pains, those oppressed by demons, epileptics, and paralytics. This is a description not just of the crowds, but of the world around us — a fallen world that suffers the effects of sin in every facet of body, mind, and spirit. It is a glimpse of the reality of our world, not the illusion we create to cope with life, but the real world with problems that are beyond us. A world that lives by different standards than his. A world that has been turned upside down by our sin. The gospel of the kingdom that Jesus teaches, proclaims, and makes visible in his healing is the good news of the rule of God. It is the glorious vision of what God intends our lives to become. A vision of life lived his way instead of ours; a life of comfort and satisfaction, of mercy, of close personal relationship with him that encompasses the whole earth. It is a life that is restored and renewed to all it was originally created to be. This is good news indeed, for it is the message that this kingdom is for the upside down people who are broken by their sin: those who are afflicted, oppressed, struggling, and without hope. It is the good news that the kingdom is for those who have tried their best and realized it is no better, no more effective in dealing with this upside down world in which we live than their worst. For it is the good news that the kingdom comes not through us and our efforts but only in Jesus Christ. That through him alone God turns this upside down world right side up, healing every disease and every affliction, restoring everything, renewing everything. What the Sermon shows us is that living right side up in an upside down world means, fundamentally, bowing to the authority of Jesus. So the Sermon addresses all of our lives. Jesus shows that it is not just about Sunday morning, about our “religious beliefs,” but that in our character, our influence, our relationships, our ambitions, and even the very goal of our life that our lives are to be different visibly, radically, and comprehensively from both the secular world and nominal church, the religious and the irreligious. As we live in this upside down world our attempts at life keep hitting ceiling below us. 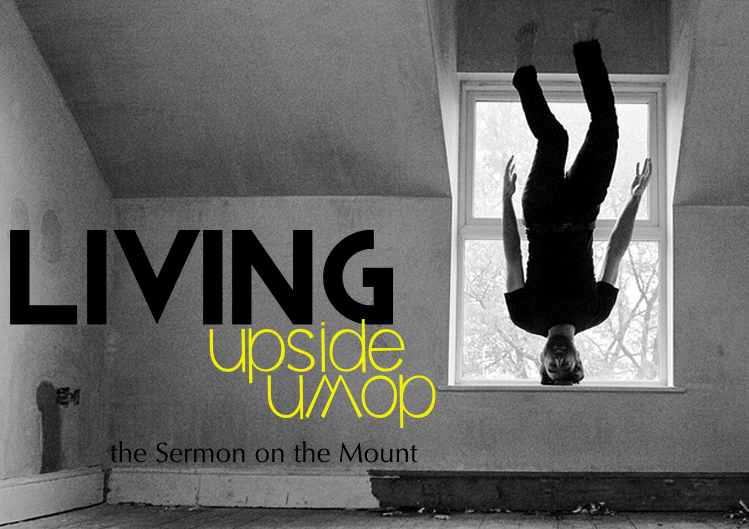 The Sermon, then, challenges us in mind, will, and body with the gospel of the kingdom: that only in Jesus can we live upside down from the world’s perspective — or as it really is: living right side up in an upside down world.